French vanilla, artificially flavored. 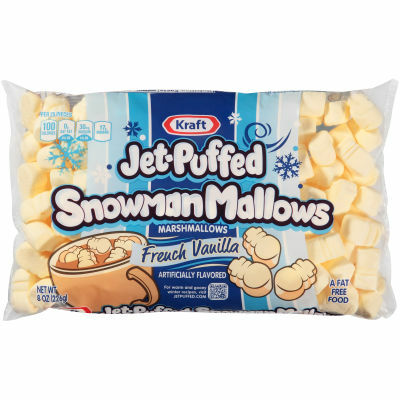 Tips & Fun Uses: Chocolate-Coated Snowman Mallows: Dip Jet-Puffed Snowman Mallows in warmed Baker's Dipping Chocolate for an indulgent winter treat. Snowman Hot Chocolate: Top each mug of hot chocolate with a few Jet-Puffed Snowman Mallows. Serving size 25 pieces (30g).